I don’t see them as such. I see them as transformative acts of appropriation; people have taken the future of Confederate memorials into their own hands, and have changed their meaning in the process. Their creative engagements with these objects reframe these memorials in new contexts, which is a necessary step in the process of determining their future in public landscapes. On the evening of August 14, a woman climbed a statue of a Confederate soldier in Durham, North Carolina, and slung a rope around the figure’s neck. A group of men and women began to pull and soon – sooner than you might have expected – the statue toppled head-first into the ground and crumpled. Made of cheap bronze and cast as a hollow sculpture, the “Silent Sentinel” remained on the ground for only a few hours. Town officials came and hauled the crushed, jagged heap of metal away. This is unfortunate; leaving it where it was would have been an effective memorial to the cheap and hollow souls of white supremacists, and to the strength and commitment of those who protest against them. 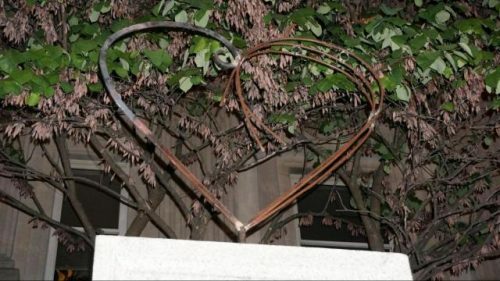 One week after the Durham soldier came down, another sculpture replaced it: a metal heart, mounted on the pedestal. It was an example of how art can reshape a place, and change its meaning. This new sculpture did not last long; the police came to the site within hours and hauled it away. I can’t help but wonder if the crumpled soldier and the metal heart are sitting together somewhere, in a Durham storage facility. If so, what an eloquent Still Life of Protest that would make. 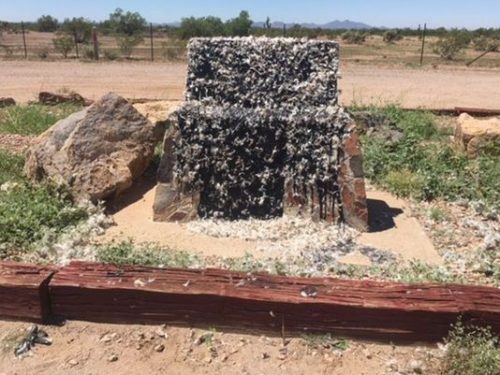 On Thursday, August 17, passersby noticed that the stone monument marking US Route 60 (east of Phoenix) as “Jefferson Davis Memorial Highway,” had changed markedly in appearance. Someone had poured tar, and then feathers, over the top of the monument. The tar has dripped into rivulets and the feathers flutter in the breeze, making this transformation a rather dynamic act of protest. It is also an act with historical meaning. In the eighteenth century, tarring and feathering was a “traditional form of maritime mobbing” usually used to punish men who “busted” smuggling operations (most of whom were not elites, but common men). Tarring and feathering attained political meaning after the British government began to target colonial American smugglers in the 1760s. Most of the time, Patriot mobs tarred and feathered a person, but sometimes they stuck tar and feathers to houses or businesses in order to send a similar kind of message. The Davis marker in Arizona becomes, then, the latest in a historic series of patriotic protests against oppression. Tarring and feathering was not just a Revolutionary War protest tactic, however. In 1971 a branch of the KKK in Michigan tarred and feathered a school principal for advocating the celebration of MLK Day. In this additional context, the transformation of the Davis marker in Arizona is a form of appropriation. Whoever did this has taken a tactic usually used by white supremacist mobs, and turned it against them. 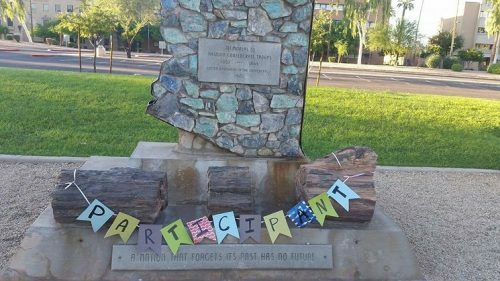 After watching Trump make his “both sides” assertions on television, Rebecca Olsen McHood drove to the Confederate Memorial outside the Arizona Capitol in Phoenix and laid two handmade banners over it: “2nd Place, P-A-R-T-C-I-P-A-N-T” read one. “You lost, get over it” said the other. The “Participant” banner is the largest, and the one that has the most visual impact. It succeeds in doing something that not many other protest acts can do: make people laugh, by revealing the absurdity at the core of the memorial: it is a celebration of a losing side, of a treasonous effort on behalf of a moral wrong. If you think of memorials in this way, it is easy to see why it is ridiculous that they dominate so many public landscapes. Birmingham (Alabama) Mayor William Bell was the first to make this move, ordering on August 15 that workmen cover a Confederate memorial in Linn Park first with plastic, then with sheets of plywood. 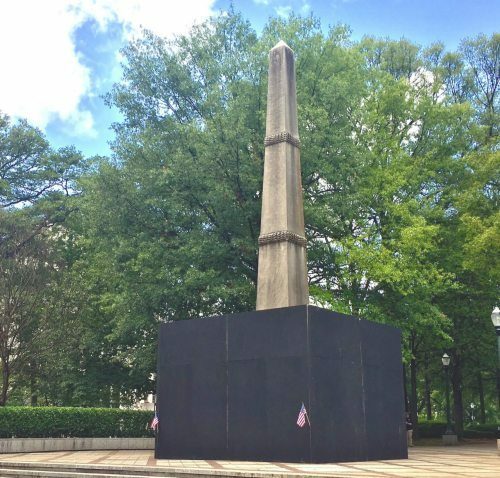 City officials and pro-Confederate organizations in Birmingham have been arguing about this memorial for more than 2 years, and Bell’s actions may have violated a state law, passed in May, preventing local governments from moving historical monuments. The state attorney-general has sued the city for covering up the memorial, which it is interpreting as an act of removal. Currently, the wood has been painted black, and small American flags have been shoved into the corners. I would love to see this surface given to African-American artists, so that they can create their own memorial on this new memorial surface. 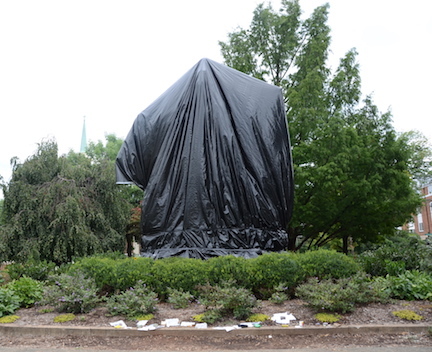 On August 23, city officials in Charlottesville also covered the Lee and Jackson monuments – the sculptures whose potential removal provoked the neo-Nazis into a frenzy of hate – with a black tarp. These shrouds were a visual symbol of mourning for Heather Heyer, who was killed in the terrorist attack on anti-hate protestors. This references many traditions among various religious groups today to mark and remember an individual’s death. Shrouding was also used as a protest tactic in the wave of nineteenth-century revolutions in Europe, to suggest how the object it covers has brought about the death of liberty. Someone removed the tarp that night, and the city replaced it the next day. This struggle will likely continue, and this act may provoke a lawsuit – Virginia has a law similar to Birmingham’s – but that’s not a bad thing. The legal battles regarding monument removal should provide more opportunities for local communities to weigh in on their future. Some of these creative approaches to white supremacist memorials have been initiated and carried through by individuals or small groups, acting from a sense of outrage and a need for immediate action. Others have come from local city councils and mayor’s offices, in defiance of state laws. Although all of these responses are temporary, they do succeed in moving beyond “retain or remove” by seeking to change the monuments themselves, and their meanings. Those who have participated in these transformations should not be sued or arrested, but lauded. The truly ironic effect of Trump, who at a minimum tolerates white supremacists, is that had someone like Hillary Clinton been elected we never would have had the opportunity to move the needle of public opinion enough to get rid of these odious memorials. Not to say I liked the result of the election, just seeing that some lemonade can be made of this lemon. Indeed – this is always the terrible irony of traumatic and violent events; they bring the jolt that brings change. Previous Previous post: The Resistance Files: How Will We Remember What Happened in Charlottesville?